This page chronicles all the changes to Dan Becker's Home Page. 2018/06/26 - Provided a photos and reports on the 28018 LifeTime Capital of Texas and Lake Pflugerville triathlons on the Race Reports page. 2017/07/16 - Provided a photos and an update on the New York City Triathlon. 2017/05/29 - Provided a photos and a brief update on the Cap Tex Tri. 2016/09/11 - Provided race photos and updates on the Cap Tex Tri (2016 May 30) and Tri Rock Austin Tri (2016 Sep 5). 2016/02/26 - Created another aerial video. This one is outdoors in a corporate courtyard, complete with trees, sculptures, rooftops, and the horizon. 2016/02/15 - Dan plays an original song Dirty Dishes . It started with some jazzy chords, but then with the piano solo, it ended up sounding like a Burt Bacharach tune. Oh well, I guess Burt has implanted a chest splitting alien in me. 2016/01/30 - Here is a longer aerial video of a three story atrium in an unnamed building in Austin, Texas. Notice the three other remote control copters in the video. 2016/01/18 - I made another brief aerial video of a three story atrium in an unnamed building in Austin, Texas. 2015/12/24 - I made a brief aerial video from a remote control quad copter. See the trees and houses in our Austin neighborhood. 2015/12/08 - Power MIDI devices from a USB DC power source: MIDI Power page. 2015/09/05 - Added a miniatures Reader Contributions page. The latest submission is David Branyan's photos and stories about his dice tower project. 2015/07/03 - I've done some triathlons recently. Read about my races at the Ironman 70.3 Galveston and the Ironman 70.3 Buffalo Springs half ironman distances on the Triathon Race Reports page. 2015/04/03 - Took a ride on a WWII-era B-24 Liberator. The plane WitchCraft was meticulously restored and run by the the Collings Fountation. It was a great ride in which I got to sit in most of the crew positions. 2015/02/28 - Updated the Weather Page and added links to Dan's Personal Weather Station KTXAUSTI464. 2015/01/11 - This year Dan Becker's Home Page celebrates twenty years of being on the World Wide Web. First hosted publicly in 1995 on the defunct io.com web host, the site was also shared privately as early as 1994 as an experiment at Dan's employer-at-the-time IBM. It has been a joy sharing the stories and photos about music, guitars, board games, triathlons, humor, dogs, and other personally curated oddities. with all our friends and readers. 2015/01/11 - Kevin Sims provides some updated links and lovely pictures of his Middle Earth themed Settlers board game tiles on the Games page. 2014/02/23 - Dan and Aaron Hernandez play a song No Job Today . Together we wrote a song probably based on the fact that Aaron was in Austin interviewing for a job. 2014/01/13 - Dan plays a song Trenchtown Bot . It started out as an original tune, but then I was strongly influenced by Bob Marley's Trenchtown Rock . I give him credit for the melody, but the lyrics, bass, rhythm, and arrangement are me. All instruments (including the highly important güiro and vibra-slap) are done by me. 2013/12/19 - Dan plays an original song Submerged . I got a bit spooked by a local news article, a woman's body discovered in a local lake. This song describes some of the events, part true, part fiction. I started this a month ago, so sorry that the release does not fit in with the joy of the season. All instruments played by me. More songs on Dan's Performances Page. 2013/11/03 - Dan plays an original song Curious Night . This was a kind of spooky song based on some foggy nights with strange animals and nature sightings. More songs on Dan's Performances Page. 2013/09/17 - Dan plays an original song Summertime . It was a lazy hot summer here in Austin, Texas. So I wrote a mid tempo song just in time for the end of summer. 2013/06/06 - Dan participates in the Capital of Texas Tri. Some results and photos at the triathlon reports page. 2013/04/27 - Dan plays an original song Turn Out the Light . This song was inspired by some James Brown riffs and some LED lights that never shut off. 2013/03/31 - Dan plays an original song I Heard Coyotes Cry . This was inspired by some coyotes I heard singing while running one morning. Some say the coyotes are better singers than me! 2013/01/31 - Here is a lip-sync video of our work house band "Bill Me Later" playing a cover of the Black Keys' Gold on the Ceiling . More information on the recording is located on the Performances page. 2012/11/11 - Dan plays an original song Here Comes Sandy . This is a tribute to people who had to endure Hurricane Sandy in the U.S. northeast. I tried to recognize people's struggles, helpfullness, and optimism in the many days of no water, power, or gasoline after the storm. Here's hoping the song lifts their spirits and serves as a memento of the event. 2012/03/18 - Dan plays an original song Bacharach Attack . A song about having Burt Bacharach songs stuck in your head. Complete with piano, horns, and violins, just like a real Bacharach song. More details on the Performances page. 2012/01/30 - Dan plays an original song Bootser Bear . This is a standard blue progression song with some verses about Mookie, Satchmo, and Harriet and feature Dan on all instruments. The xaphoon solo makes me laugh because it honks, squeeks, and meanders all over the place. More details on the Performances page. 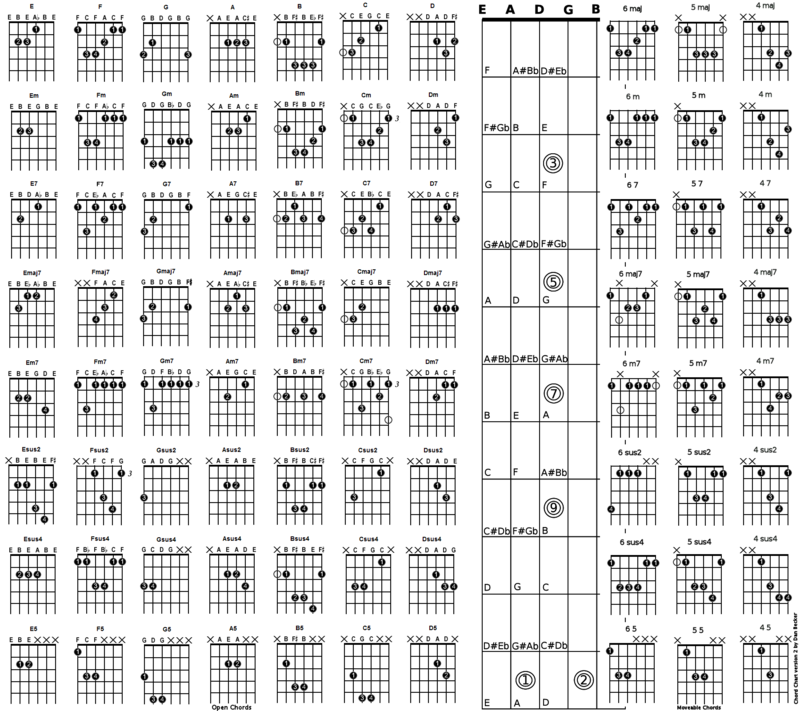 2011/12/04 - Ninths Chord Chart (explanation) - shows guitar chord chart for ninths and related chords. 2011/10/16Pedal Effects Tests - Dan demonstrates some guitar effects pedals: BYOC Reverb, Filltone Supa-Trem, Markbass Compressore, Roger Mayer Voodoo-Vibe and Weber REverb 5G15. 2011/07/24 - Dan plays an original song Tsurf Tsunami . This song is inspired by some surf music I have been listening to. Drenched in reverb and tremolo. Being from New Jersey, I had to add some glockenspiel to it. 2011/07/17 - Dan plays an original song Time Is Moving Slow . Another Sunday session on the Zoom R16 multitrack recorder. This has a slow mellow feel. Perfect for a hot summer day. 2011/07/10 - More Otto Amplfier Mods - Dan adds a 3 tap output transformer to his home built guitar amplier on the Guitars and Music page. 2011/06/12 - Dan Becker's Home Page at io.com is being sunset. After nearly 16 years being hosted at io.com, that site has sold its domain name. Dan Becker's Home Page new location is now available. Please change your bookmarks to http://www.danbecker.info/. 2011/05/07 - Chris McNorgan and Kathe Sanz write to thank me and to show pictures of their excellent 3D Settler's tiles. 2011/05/01 - Dan plays an original song Rolling and Rolling . More details on its makings are given on the Performances page. 2011/03/12 - It took a long while for me to put into words a Tribute to Harriet. 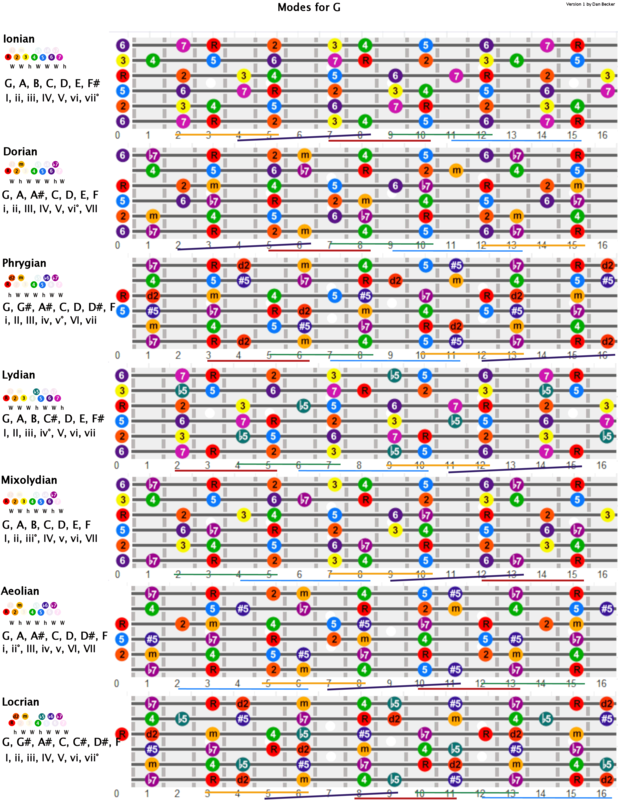 2011/02/26 - Updated the chart showing Harmonized Seventh Chord Progressions on the Guitars and Music page. 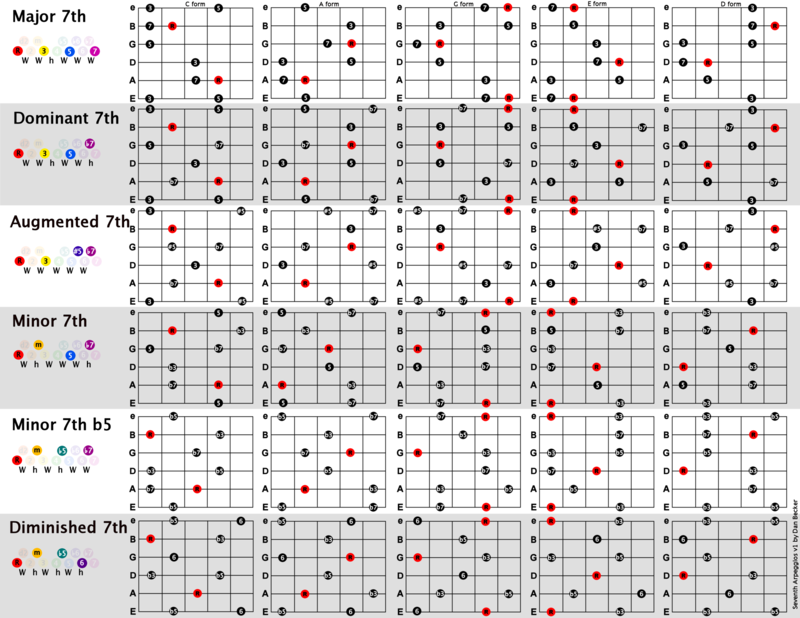 Now the chart shows some 3-7-R-5 patterns, and the patterns on the fretboard become more clear. 2011/02/05 - Power-scaled Otto Amp - Dan adds a London Power SB-84 power scale circuit to the Otto Amp. 2011/01/22 - Dan plays an original song I Ain't Got No Pants . More details on its makings are given on the Performances page. 2011/01/01 - Dan plays an original song Thor . More details on its makings are given on the Performances page. 2010/12/31 - Dan plays an original song Is This My Home? . More details on its makings are given on the Performances page. 2010/12/12 - Dan plays an original song Dudley's Out of Key . More details on its makings are given on the Performances page. 2010/11/25 - Dan plays OMC's How Bizarre . More details on its makings are given on the Performances page. 2010/10/30 - Updated the Harmonized Seventh Chord Progressions charts on the Guitars and Music page. Now showing two versions of each chord form, wow! 2010/08/19 - Added a chart showing Major and Minor Pentatonics on the Guitars and Music page. 2010/06/30 - Added a detailed photo article on the Power-scaled Vox AC4 Amp page. This is an 4 watt tube amp that has been power-scaled and shoe-horned into a tiny box. A one of a kind that sounds pretty good. 2010/05/09 - Added a detailed photo article on building a 5 dollar Current Limiter. This device can protect your expensive amplifiers. 2010/04/11 - Added a detailed photo article on the Otto Amp. This is an 8 watt tube amplifier I built from a kit with many mods. A one of a kind that sounds pretty good. 2010/04/04 - Added a how-to project page article that shows how to make Amplifier Tube Lights using old guitar amplifier tubes and a few dollars worth of parts. 2010/03/28 - Added a chart showing Harmonized Seventh Chord Progressions on the Guitars and Music page. 2010/02/21 - Added a detailed photo article on Vox guitar amplifier modifications. See how I hacked and nearly killed my Vox amplifier. 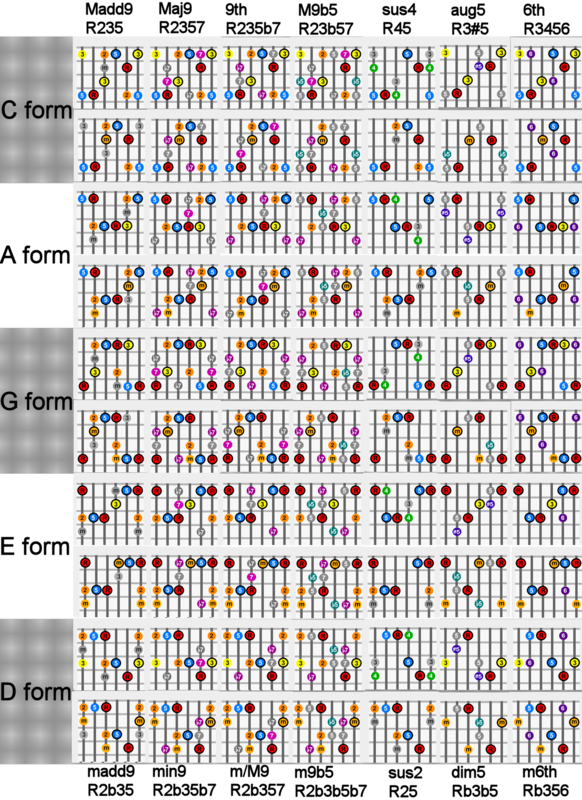 2010/01/24 - Added a chart showing positional CAGED forms for Major and Minor Chords on the Guitars and Music page. 2010/01/24 - Added a chart showing positional Relationships of Major and Minor Forms on the Guitars and Music page. 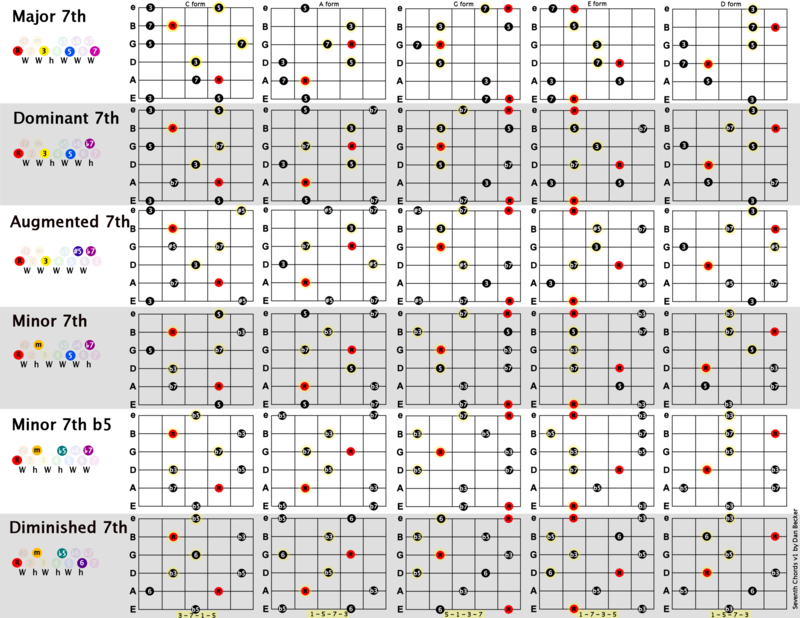 2009/12/27 - Added a chart with Seven Modes of G on the Guitars and Music page. 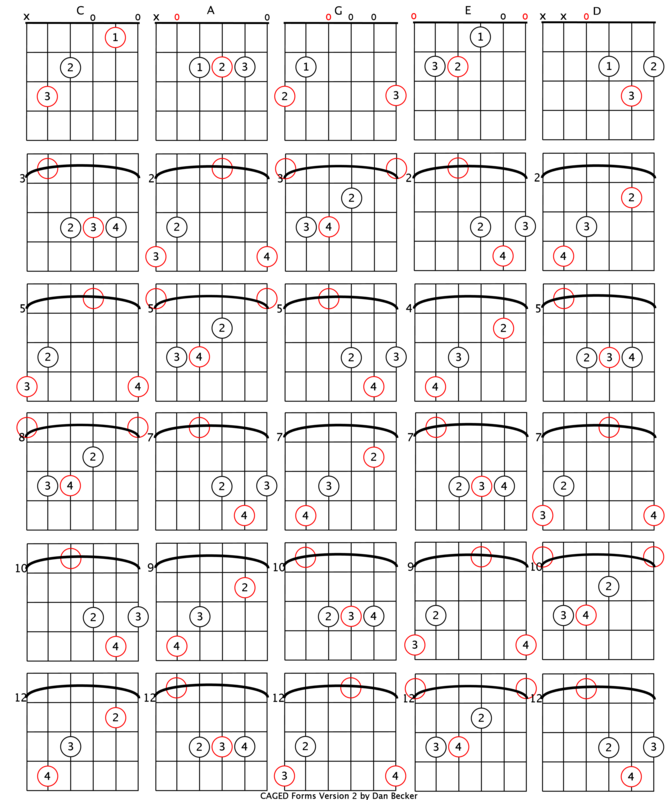 2009/11/29 - Added a chart with Seventh Chords on the Guitars and Music page. 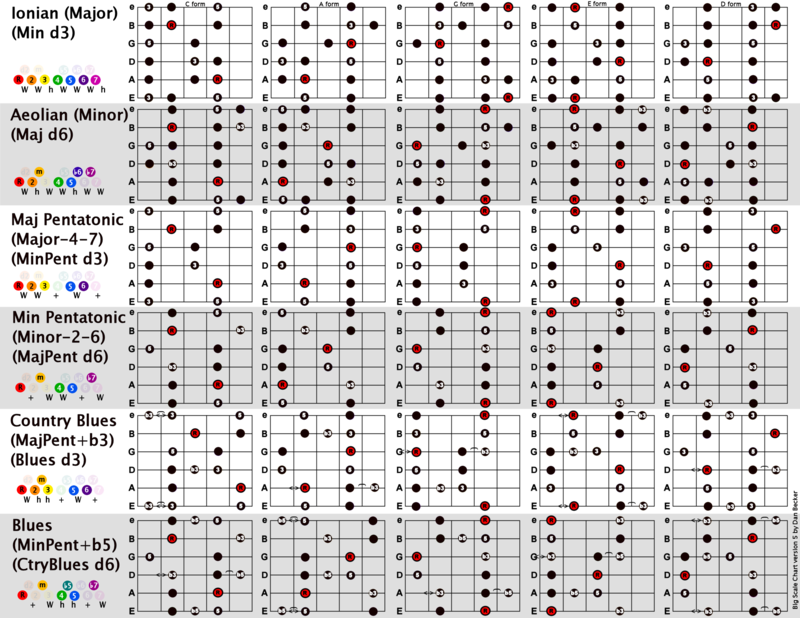 2009/10/18 - Added a dense chart of 72 Triad Chords on the Guitars and Music page. 2009/10/04 - Added a chart with Seventh Arpeggios on the Guitars and Music page. 2009/09/12 - Updated the chart with Scales (major, minor, pentatonics, blues) on the Guitars and Music page. 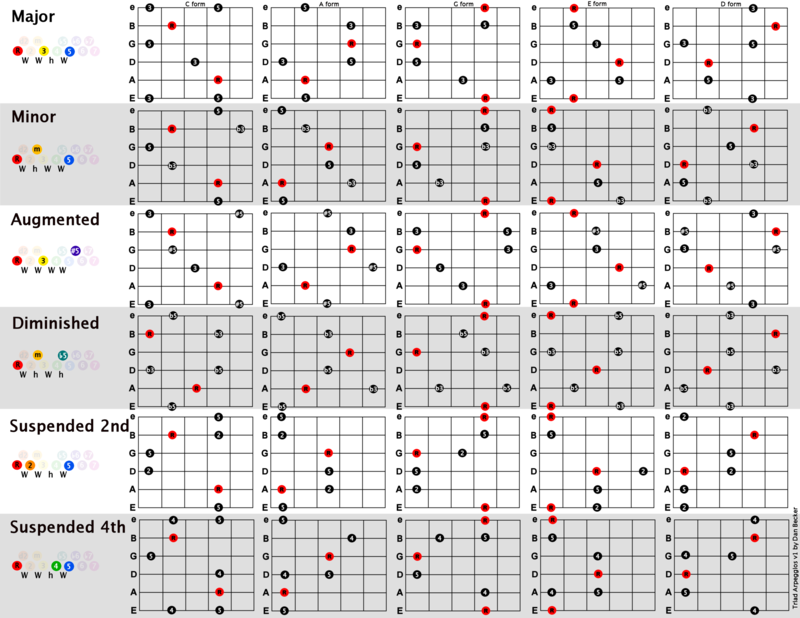 2009/08/30 - Added a chart with Triad Arpeggios on the Guitars and Music page. 2009/08/22 - Took a swing at my first performance The Beatles' We Can Work It Out . 2009/07/05 - Added a new section with charts and articles on Guitars and Music. 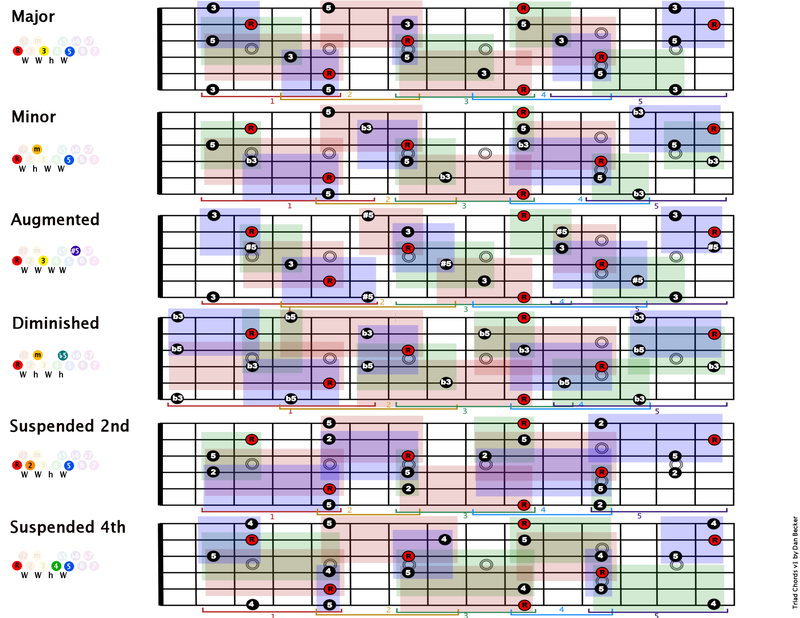 Featured charts include the Big Chord Chart and the CAGED Forms Chart. 2009/04/02 - Painted a Confederate and a Union army for the American Civil War. 2008/11/27 - Added an article and photos of the brightly bedecked Achaemenid Persian Army in 20 mm plastic. 2008/09/05 - I created an article on the 12 best Running Hills in Austin. 2008/09/03 - Painted some Celtic Warriors and Imperial Roman Legionaries from Warlord Games. 2008/09/03 - Created and article detailing King & Country's Adolf Hitler and Winston Churchhill 60 mm metal miniatures. 2008/07/15 - Added an Atom feed for people who like to use feed readers and live bookmarks. 2008/07/13 - Painted some inexpensive plastic army men. 2008/07/06 - Created two brief articles with photos of a Viking army and a Saxon army. 2008/04/21 - Added an article and photos on Alexander's Macedonians in 20 mm plastic. See the phantastic phalangists and pachyderms. 2008/04/06 - Added an article and photos on Hoplites and Thracians in 20 mm plastic, a continuation of the Alexanderian Macedonian Army. 2008/03/30 - Added an article and photos on a 54 mm Celtic Chief from Andrea Miniatures. 2008/01/27 - Added an article and photos on Alexander's Macedonian Army in 20 mm plastic. 2008/01/27 - Added an article and photos on creative uses for magnets. 2007/12/17 - Added a final train article with photos of people and trains. 2007/11/25 - Added a set of reference charts for Vallejo, Reaper, and Foundry paints. 2007/11/18 - Added an article with some photos and pondering on grass and trees. 2007/11/11 - Added an article on how to make model train streets and sidewalks. 2007/10/19 - Added an article on the train layout building and car models. 2007/10/14 - Finally added some wonderful tunnels and mountains to the train layout. 2007/10/14 - More modeling with a model train steel plate bridge article. 2007/10/12 - Another model train article with more more track layout detail. 2007/09/12 - The next model train article is laying out track. 2007/08/26 - New feature! Model trains. The first article is building a model train table. 2007/06/09 - Modelled a pilot and a spinning propeller for a Wings of War WWI Airplane. 2007/06/01 - Added some photographs of the Wings of War WWI Airplanes. 2007/05/31 - Painted some Gripping Beast King Arthur horsemen for an Arthurian army. 2007/04/01 - Painted some Gripping Beast Viking horsemen for a unit of Viking cavalry. 2007/03/11 - Painted a few nostalgic models harkening back to my childhood - Dinosaurs. 2007/02/11 - Completed painting my BattleLore figures. More photos. 2007/01/15 - Added a few words and nice photos of Jacob Cord's 3D Settlers tiles. 2007/01/02- We have a new puppy. Some photos are located at The Puppy Page. 2006/12/10 - Painted some Gripping Beast villagers and some Black Tree Design viking bondis. 2006/12/10 - Started painting my BattleLore figures. 2006/11/01 - Created a photo animation of the Commands and Colors Battle of Ilipa of 206 B.C. 2006/10/10 - Added some photos for the 6 mm Battle of Zama of 202 B.C. 2006/10/10 - Created an article on my Baccus 6 mm Roman army. Warning: lots of photos! 2006/08/20 - Painted a few Alpha 54 mm ancient Romans and Germans. 2006/08/13 - Painted a bunch of garden gnomes, hounds, foxes, and gators. 2006/08/11 - Read Sir Barcardi's magical recast of the Ale Knight Ale Quest of 2006. 2006/08/06 - Created a short preview article with photos on my GHQ Terrain Maker Commands and Colors Ancients board. 2006/08/06 - Read Sir Bernard Duke of Chutney's excellent recounting of the Ale Knight Ale Quest of 2005 at the New York Renaissance Festival. 2006/08/06 - Added a few words and nice photos of Tim Stoner's 3D Settlers tiles. 2006/06/11 - Created an article on my Baccus 6 mm Carthaginian army. Warning: lots of photos! 2006/03/26 - Created some preview photos of Baccus 6 mm miniatures and GHQ terrain. 2006/03/12 - Painted Steve Barber Models 25 mm Knights at Tournament scene. 2006/02/26 - Painted the Mirliton miniature 28 mm Duke's Banquet scene. 2006/01/05 - Painted the 28 mm miniature Medieval Tavern Scene scene from Mirliton. 2006/01/04 - See how to make sculpted resin bases for your 28 mm miniatures. 2005/11/27 - Wrote an article on making a chain mail coif. 2005/11/23 - Double whammy! Wrote and article on painting and playing the Lord of the Rings Mines of Moria miniature board strategy battle game. 2005/11/22 - Added photos on painting a 54 mm Celt of the La Tene period. 2005/10/24 - Added an article on painting and playing the Battle of Hastings in 10 mm. 2005/10/21 - Added a link to the World's Tallest Water Sphere, Union, New Jersey's Wonder of the World. 2005/08/27 - Make a Five Dollar Spangenhelm - make a cheap replica helmet great for costumes or casual pillaging. 2005/07/10 - Wrote an article with some ideas for rank decorators for miniatures wargaming. 2005/07/10 - Added some wonderfully gratuitous panoramic miniature movies. 2005/05/30 - Added a battle report of Warhammer Ancient Battles Saxons versus King Arthur. 2005/05/29 - Created another Gothic episode of Hagbard and Hrothgar at the Hagbard and Hrothgar page. 2005/05/29 - Added an article on painting Saxon Huscarls and Thegns. 2005/05/22 - Added some updates and wonderful photos of Gerard Boom's 3D Settlers Tiles. 2005/05/08 - Added an article on painting an Arthurian warband. 2005/04/10 - Updated one of the early dice tower articles with a submission from JR Hendricks of Texas Tech at Lubbock, Texas. 2005/04/10 - Wrote an article on paint brush sizes. 2005/03/30 - Created episode 4 of Hagbard and Hrothgar with some fun-loving monking around. 2005/02/13 - Added an article on the painting of Grenadier Book's Seven Years War British Grenadier. 2005/01/23 - Wrote a review of Dragon Model's Olaf the Viking 1/6 scale action figure. 2005/01/23 - Created a Ancient British (II/53) army for the DBA miniatures war game. 2004/12/31 - Hacked! This site was hacked sometime during the week of 2004/12/20. The site was fixed on 2004/12/29. I apologise for any rude or indecent images that might have showed in the games section. 2004/12/04 - Wrote a article comparing scales in models, miniatures and model railroads. 2004/11/24 - Added a new site section for Miniatures and Models. 2004/08/08 - Read Ale Knight Sir Barcardi's excellent account of gifting a shield of honor to Matty Grove's Pub at the New York Renaissance Festival. 2004/07/11 - Added more French Infantry Company photos. 2004/07/11 - Sauron for Sale! The evil Sauron with the red glowing eye described in the article Transmogrifying Sauron is for sale on EBay. Please do as Sauron requests and bid wildly. You will be rewarded with the riches of Mordor. 2004/03/25 - Everyone knows that Brien Muschett Should Eat at Tan Tan. 2004/01/24 - Created a comic strip Hagbard and Hrothgar based on some 28 mm gaming miniatures I've painted. 2003/06/22 - Created a dancable remix of the Lords of the Rhymes first single. Support the dying art form of hobbit rap by listening to DJ Mook Munster's LOTR Slave Remix (MP3 format, 96 kbs, 2.2 MB, 3:12 duration). The song is also available in high definition (MP3 format, 192 kbs, 4.4 MB, 3:12 duration). 2003/05/26 - Ran the Austin Capitol of Texas triathlon. Beautiful conditions and a nice downtown course make for a great race. It also doesn't hurt that the race has expanded to over 800 Olympic distance athletes, 600 spint distance athletes, 300 first-time triathletes, and over 2000 spectators. 2003/01/26 - Updated the look of the front page. I always liked trees and earth colors. Let me know if something looks ill on your browser. 2002/11/26 - Added a tile distribution chart for Klaus-Jürgen Wrede's Carcassonne: Hunters and Gatherers game on the Game Review page. 2002/11/24 - Read my second, much better attempt at making armor in Scale Armor Revisited. 2002/10/20 - Read an article about making chain mail for a steel Spangenhelm. 2002/09/08 - Read an article on my attempt at making Scale Armor. 2002/09/02 - Sir Bacardi provides a wonderful recounting of Ale Quest 2002. 2002/08/25 - Updated photos on the Puppy Jamokes page. Also, sadly, added a Eulogy for Bailey who died on August 22, 2002. 2002/07/16 - Read how to properly model Britannia In Scale using miniatures and lots of land. 2002/06/09 - Added a review of Karl-Heinz Schmiel's Was Sticht? card game on the Game Review page. 2002/05/27 - On Memorial Day, I ran the Capitol of Texas triathlon in Austin. Conditions were perfect with 70 degree water temp, 70 degree air temp, and little wind. It was also great to blow through red lights on Congress Avenue while the Capitol loomed in the background. Read more in the Race Reports page. 2002/05/26 - Added a review of Carcassonne: The Expansion game on the Game Review page. An easy-to-print tile distribution is available also. 2002/05/26 - 1995/08/21 - Did not save any but the last 10 changes. 1995/08/21 - Dan Becker's Web Site was first hosted publically on IO.COM. Before this the site was hosted privately at IBM for about a year. 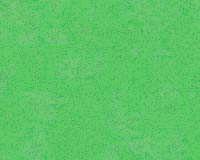 Document last modified: Monday, 25-Feb-2019 09:25:56 MST.